Divorce changes everything for you and your family. This is a time when you need a lawyer you can count on. The experienced, creative and compassionate attorneys at Cervizzi & Associates listen to your unique story, educate you on your legal situation and help you understand your choices. You do have choices in a divorce, even when it doesn't seem like it. We are here for you to help you find the right path that is best for you and your family. With more than 25 years practicing law, Laura J. Cervizzi founded Cervizzi & Associates in 2002 as a boutique firm dedicated exclusively to divorce and family law litigation. 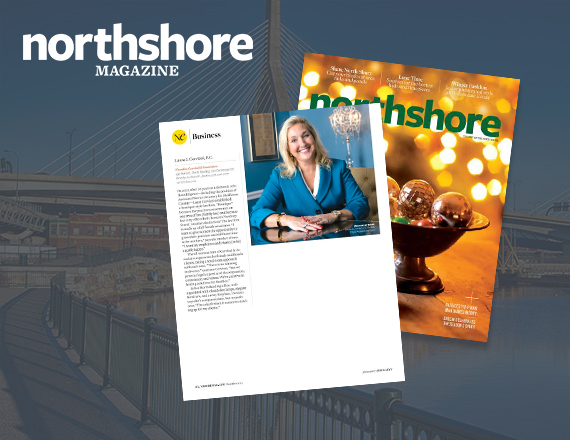 She has brought together a team of close-knit attorneys to represent clients no matter the size or complexity of your case, whether uncontested by parties who are agreeable and have limited issues, or when matters are contested and contentious. We know each case is different, and we tailor legal solutions that will work for your particular situation no matter how challenging. Cervizzi & Associates represents individuals and families statewide in every county throughout Massachusetts. 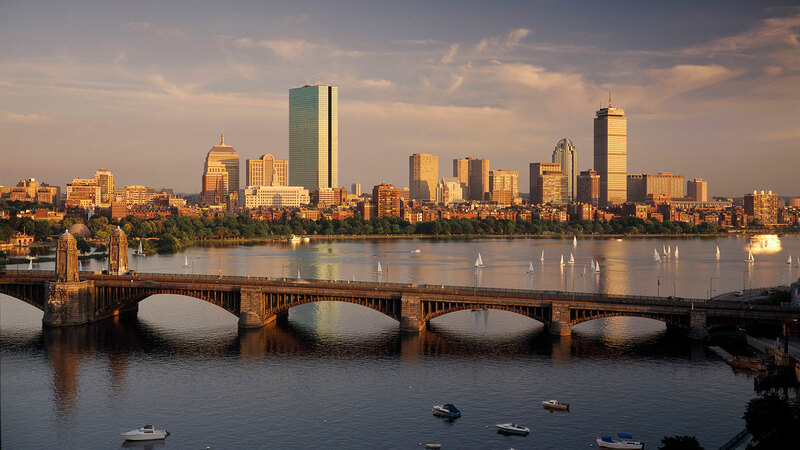 We have offices conveniently located in Boston, Beverly and North Reading, Massachusetts. 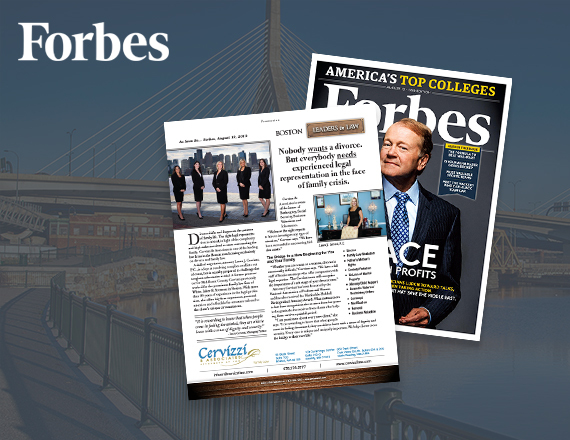 Cervizzi & Associates provides the same superior level of service found in larger Boston firms at affordable rates. For trusted legal advice on your divorce and family law matters, contact Cervizzi & Associates to arrange for a free initial consultation. 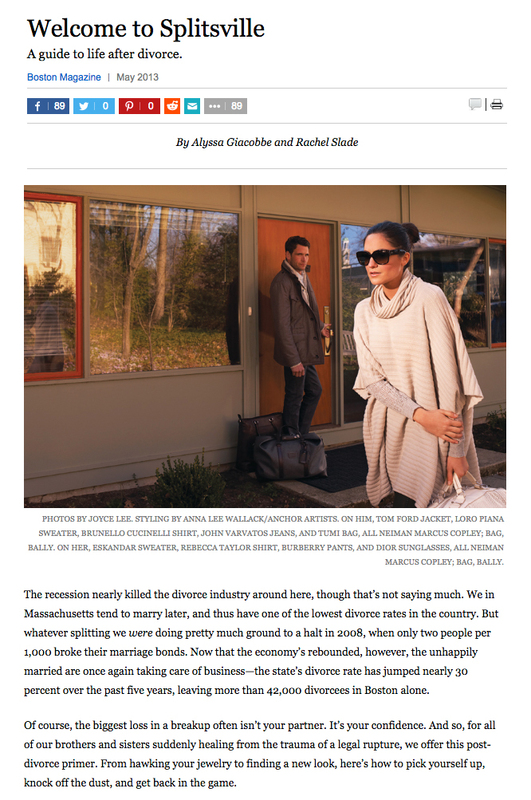 Any questions, please call the firm at 978-276-0777. We now accept all credit cards. 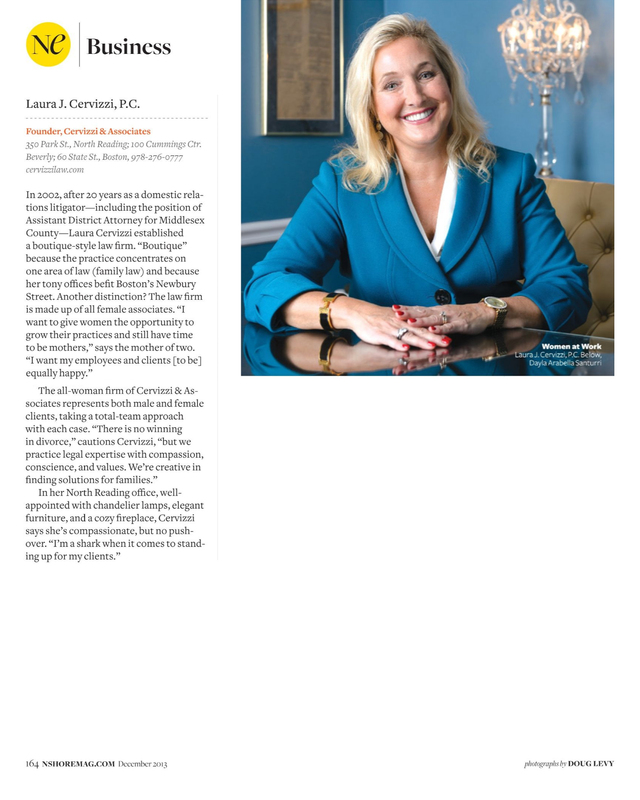 Please see our featured article in “Forbes Magazine”, in the Leaders in Law section. 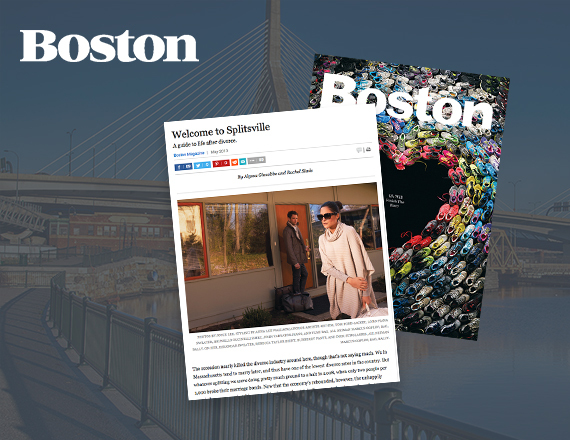 Please see Cervizzi & Associates featured in Boston Magazine's "Welcome to Splitsville" Divorce Section. 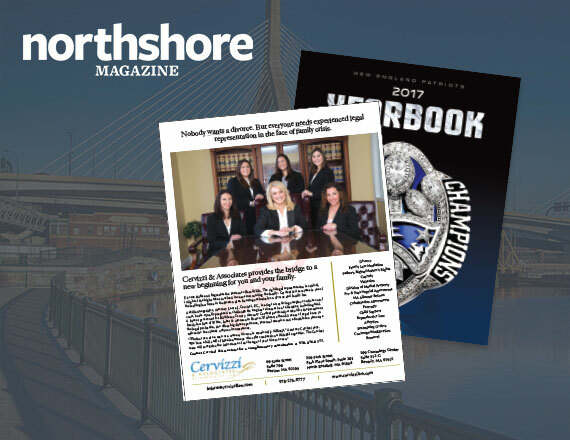 "I went to Cervizzi and Associates over 3 years ago to discuss with Laura Cervizzi about divorcing my husband, after my decision was made Laura paired me with Atty. Amy Kraft a young, conscientious lawyer. I was a bit hesitant, but Laura assured me she would be the right person for the job. And two years together, she was the right person, she was kind, compassionate brilliant and always there for me in my darkest hours she wasn’t after two years my attorney, she was my friend and guardian she understood me and how I would react to what was going on through this ordeal a wonderful diligent young lady, I am so grateful for her coming to my aid, keeping me on track and for the wonderful relationship which blossomed with all at Cervizzi and Associates. If anyone is in need of this type of service these are the group of women to take care of you from Laura, to Priscilla and gratefully to Amy. Thank you to all of you, you are simply the best." "Laura C., I wanted to sincerely thank you and your office for all that was done to help me through my divorce. I appreciate your patience, consideration and concern through this process. I am looking forward to the new year!" Cervizzi & Associates is located in North Reading and serves clients in the following counties: Middlesex, Essex, Norfolk, Suffolk, Barnstable, Briston, Berkshire, Dukes, Franklin, Hampden, Hampshire, Nantucket, Plymouth & Worcester.